We recently tried something (in the interests of science and all) that we think many of our readers and Team Winding Road members would enjoy. We hosted a race-within-a-race. It is pretty easy and costs very little (as low as $0) assuming you were already going racing on a given weekend. But the big point is that it can be really fun. Though there could be many reasons you’d want to create your own competition, the basic idea is simple. Below are a few examples. You might run a car that normally has really low car count (1 or 2). You could decide to run a race-within-a-race to attract more cars in your class. This might also apply if you run in a class where your version or period of car is simply no longer competitive (example: we have Radical SR3 that is classed in SCCA P1, but is not a competitive car there; we could do a race-within-a-race for 1500cc Radical SR3s). On the other hand, let’s say you race in a group that typically has 30 cars in it. Maybe you and some of your racing friends are usually separated on grid by a row or two (you’re usually on row 2 or 3, you have a friend who is more like a row 5 or 6 guy and another who tends to be on row 6 or 7). So normally you wouldn’t be racing head to head. Under normal circumstances it could happen that you run together, but that probably won’t be the case. By creating a race-within-a-race, you have a way to compete that won’t occur naturally on track. Another thing you might like is to do some team racing. A lot of racers we know really like the camaraderie of a team, and by creating a race-within-a-race you can join forces with someone. This approach requires an event long enough that a driver change makes sense, of course. And, sometimes you need to be willing to give up the overall race if many of the racers will not be doing a pit stop (note that SVRA, and some others, conveniently have an “enduro” format where timed pit stops are required, so driver changes are not disadvantaged). We love team racing, so our first idea (because your humble servant usually races with his son) was to create a race where fathers and sons make up teams. We are open-minded people who really want more women competing on track, so we defined “father” and “son” pretty liberally (see our example rules below). We then faced the challenge of handicapping so that father-son teams of different skill levels would have a shot at winning. For father-son racing we used a handicap based on age. 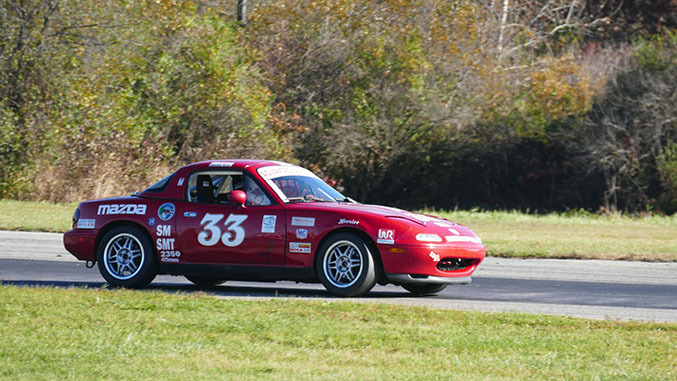 One of our father-son teams runs a T4 MX-5, not a Spec Miata. Fortunately, that car runs in the same MCSCC group we were targeting so we let them in. At the last minute, we handicapped that T4 car based on lap time differences from the prior day’s racing (we could have used class lap records as an alternative). We’re tired of tiny, cheap plastic trophies, so we shopped online for the biggest metal and wood trophy we could find. We decided to make it a travelling trophy, since we plan to hold this event every year (this conveniently reduces the cost/year of the trophy, too). Then we sat down and wrote some rules. Racers, being competitive people, want to know the rules in advance so they can try to exploit them for advantage. Therefore, we recommend thinking the rules through carefully. Our rules are reprinted below as inspiration. 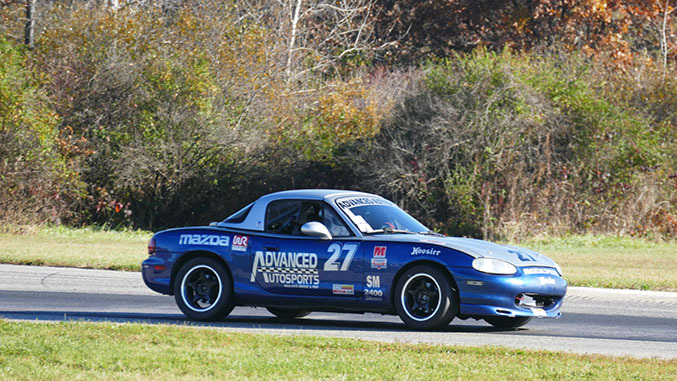 When it came to race time, we had 8 racers on 4 teams competing in the International Father-Son Challenge, sponsored by Advanced Autosports and Winding Road Racing. The Loooong Race runs for 50 laps or about 1 hour and 10 minutes, so each driver would be in the car for 30 minutes plus or minus a bit depending on team strategy. In the race, the winning car finished 10 seconds ahead of the second place car. Of note, the second place car went briefly off track with five laps to go while catching the leader at 2 seconds per lap, making us think our BOP formula was pretty good (or even a blind squirrel…). 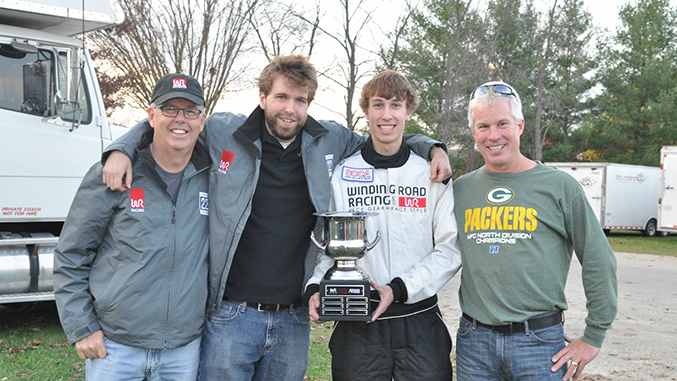 The second annual International Father-Son Challenge (IFSC) will be held Sunday, October 25, 2015 at Blackhawk Farms Raceway in South Beloit, Illinois. The basic rules for this race are established by rules of the Midwestern Council of Sports Car Clubs. Special rules for the IFSC competition are set by the team that won the prior year’s competition (in this case the Muskego Road Racing Club under the chairmanship of Team Brown), with “advice” (a.k.a. veto power) from the sponsors of the competition (Advanced Autosports and Winding Road Racing). These three groups form the Governing Body of the IFSC. The IFSC will be a special competition within a competition, held during the ITA race (Group 4) at 1:35pm on the Sunday of the Loooong Race. Competition will be among IFSC teams. 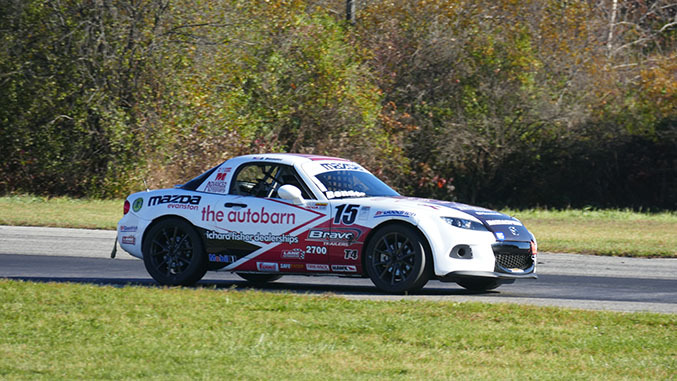 Team cars will be Spec Miatas in Spec Miata trim. Scrutineering by Advanced Autosports. Of the team drivers, one must be a “father” and one must be a “son”. These are not arbitrary designations, though we are using somewhat unconventional definitions so read the following carefully. All “fathers” must have or have had biological human offspring (note: this means that an IFSC “father” may actually be a biological woman who has had children); offspring may be either male or female. All IFSC “sons” must be human; either male or female. The “Father” and “Son” on a given team need not be biologically related. So, Kettelkamp (certified father) could form a team with Steve Krock (certified human, thus a son, though not biologically related). Kettelkamp (father) could also form a team with Danica Patrick or Maryeve Dufault (women, but qualified as “sons” under IFSC rules). Ann O’Malley (certified “father” under IFSC rules because she is a biological mother) could form a team with Thomas Bernacki (certified son, because human). A generation gap is required between drivers. Either the “father” or the “son”, as defined above, must be over the age of 40. Note: if the “son” is over the age of 40, the “father” may be any age, though he or she must still meet the requirements for “father”. 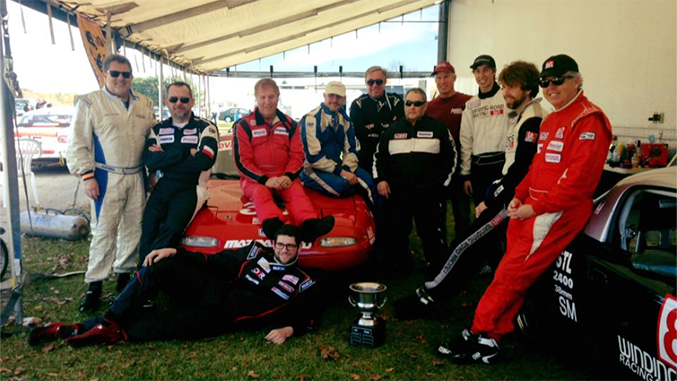 Of the team drivers, only one may be a “Pro” and at least one must be an “Am”. It is also acceptable for both drivers on a team to be “Ams”. “Pro” drivers are: Voytek Burdzy, Tom Brown, Dan Ibrahim, Thomas Bernacki, Tom Sager, Justin Elder, Danny Bender and anyone else who turns out to be really fast on race day (as in Pirelli World Challenge you can get bumped from “Am” to “Pro” by the governing body -- so if you might be a "Pro", be sure to choose an “Am” teammate). If your head hurts at this point, you may not be suited to IFSC competition. Consult your physician. One pit stop during the race is required. This is the time to do your driver change. Although if you choose to do it while your car is running on track, please tell Ann so she can take appropriate photos. The required pit stop will be a minimum of 3 minutes in length. The actual pit stop length for a given team will be Z = 3 minutes + (175 – 2x (combined age of team drivers)) seconds. So, if a team has one driver age 52 and another driver age 22, then that team’s pit stop will be 3 minutes and 27 seconds (the 27 seconds = 175-2x(52+22). Pit stops will be measured by an advanced team-programmed egg timer placed on the trunk lid by Advanced Autosports during the pit stop. Egg timer shall be started when the team car stops. It will be removed at the Z point (ding! ), and the driver will be allowed to go if all other pit maneuvers are completed. Other pit stops, if any, are not timed. Pit speed limit is 35 mph or the speed limit set by MCSCC. Both drivers on a team must drive during the race. Minimum drive time for a given driver is 20 minutes. Maximum drive time for a “Pro” driver is 35 minutes. The winners of the race will be determined by the lowest total elapsed time as recorded by MCSCC. To win, cars must be running at the end of the race. The trophy is pretty close to huge and definitely awesome. It will be “engraved” (via label maker tape or other means) with the winning team names. We hope. It took Brown 359 days to get last year’s trophy engraved. YMMV. Winners get to keep the trophy for the year (approximately) until the next IFSC competition. The Governing Body of the IFSC shall have power to make all Laws which shall be necessary and proper for carrying into Execution the foregoing Powers, and all other Powers vested by these rules in the Governing Body, or in any group thereof. If you don’t understand the word “all” in the previous sentence, it means rules may be amended, updated, or changed at any time, including after the wrong team has won (not really, probably).